“Greed is good” was the story of the Plantronics UKDota.net Science Cup, held Saturday February 22nd last. With hard farming line-ups the order of the day, combined with minimal aggressive support action to punish those choices, the general theme was whoever had more cores, more farm or more Midases carried the day. Whether the greedy line-ups were in response to passive support picks and play, or whether they're due to the UK scene being more comfortable with ricing than aggressive rotation, it was an interesting feature of the Science Cup. The arguable pick of the first round matches, ForLove.kr facing off against TorN Gaming, saw ForLove pick a much more dynamic, but farm dependent tri-core line-up. TorN Gaming seemed to pick a more reactive anti-carry line-up with an Alchemist as their arguable sole hard-carry. However, despite setting their stall out for counter-aggression, they then proceeded to play the game at the tempo that ForLove required to establish an early midgame dominance and squeeze map pressure to close out the game with relatively few headaches. TorN never seemed to get their line-up functioning as it was intended, perhaps since Crystal Maiden is the only support they picked that has a guaranteed early game impact, and even in the few minutes it took for their other pressure-creating heroes to come online, the farm battle had started to slip away from them. The rest of the round was relatively upset free, with the reputed “big-hitters” making it through to the Quarter-Finals intact. On paper, the juiciest match-up of the Quarter-Final stage was [R]eason Gaming facing ForLove.int, where ForLove excellently deployed a Meracle-build Naga Siren to choke Reason with their total map control. However, the game did lose some of it's gloss when it became clear that Reason weren't taking it the most seriously. The battle of most interest in this match-up was in the mid-lane where Reason chose to set their Ogre Magi against ForLove's Brewmaster. Brewmaster is a hero that doesn't see a lot of competitive play, since he's one of those heroes that depends heavily on his ultimate to be useful to the team. However, when laned against an Ogre Magi, ForLove had very few issues securing him his core items and in tandem with arch tempo-controller Naga Siren, with her irritating ability to counter-initiate or disengage using Song of the Siren, the pick allowed ForLove to fight devastatingly on their own terms. Again, the story of the match was about farm-dependency and timing. Recognising that carry Naga Siren is a greedy strategy, ForLove picked very dynamic early game heroes, with Chen and Rubick doing an excellent job creating space for their carry to farm in. When combined with the Windrunner and Brewmaster, the segue into midgame control was seamless (at which point the arrival of the farmed Naga Siren was merely an incredibly annoying Rat-Dota coup de grâce) and the timings of Reason Gaming's heroes always seemed a minute or two later than they were required, with their Earthshaker's blink dagger arriving some time after it was too late for it to impact on the game. In the other matches in this round, ForLove.kr were beaten by HoneyRoastHAM, while Dwayne 'The John' Rockson and UOENO joined the others in the Upper Bracket Semi-Finals with relatively expected victories. UOENO took on ForLove.int in the most closely fought of the two semi-finals. This game subverted the general trend in games so far, insofar as there was excellent early game rotation from ForLove.int that secured them a number of good kills in the first 15 minutes. However, since UOENO had opted to farm a Weaver and a Shadow Fiend, and once those heroes got their items up, the tide of the match started to turn. The Shadow Fiend announced it's presence in a brutal fight mid after a quiet early game, and following a series of messy fights that seemed to happen disjointedly all over the map, eventually UOENO managed to push high ground after picking up aegis on Weaver, despite Chen stealing the cheese for ForLove. After another chaotic fight with numerous buy-backs from ForLove, Weaver's DPS, especially with aegis, turned out to be too much for ForLove to handle. Had ForLove managed to pick off either the mid or carry a few more times in the early game, the story of this game could have been different, but as it happened, UOENO reached the Upper Bracket Finals, joined by Dwayne242 who rolled over HoneyRoastHAM in the other semi-final. UOENO faced Dwayne242 in the Upper-Bracket Final, with the winner taking a place in the Grand Finals. Both teams drafted greedy line-ups for Game 1, with Dwayne making the incredibly greedy decision to run a solo-offlane Lifestealer and UOENO drafting a very farm dependent hero in Morphling. UOENO seemed to be having the better early game, but Queen of Pain, in the top lane, was massively outfarming every other hero on the map, picking up an early midas and having near perfect CS over the first 15 minutes. The mid Invoker for the other team also picked up a midas, which might have been UOENO's undoing, since Morphling was still a very long way from being ready to fight, and the ability of the rest of the team to make space was severely hampered by Invoker's inability to impact in the big team fights. In the end, Dwayne's tri-core line-up was completely up to speed earlier than UOENO’s and they managed to finish the game before Morphling became much of a factor. Game 2 was the battle of the currently overpowered heroes, with Dwayne242 picking up Ember Spirit and UOENO picking up Slark. With a tri-lane versus tri-lane taking place in the bottom lane, Dwayne's aggressive lane of Visage, Weaver and CM battling Dwayne's Ember Spirit, Bane and Rubick, the game was much more aggressive than any of the others that took place in the competition. There was excellent rotation from the trilane supports, as well as Dwayne's offlane Nyx Assassin, securing a kill a minute for the first 20 minutes. It was Dwayne242 that came off better in the early exchanges, but never managed to pull away from UOENO, especially when the Slark started exerting it's presence across the map. It became a familiar story where Shadow Fiend suddenly became a large presence in teamfights (including a triple kill in the penultimate fight) and when combined with the powerful and illusive nature of Ember Spirit, who had outmatched the Weaver in their contested lane, as they reached the late game there was simply too much for UOENO to deal with, especially since Bane just used Fiend's Grip on Weaver whenever it was possible, basically nullifying over 10K in farm with a single spell, meaning a large part of the UOENO's firepower wasn't available to deal with Dwayne's double threat. The game was incredibly close up until the last, when team fight under the Dire Tier 2 Bottom went badly wrong for UOENO and that provided the breathing room Dwayne needed to push on to take the victory and the series. UOENO faced HoneyRoastHAM in the Loser Bracket Final, which started off fantastically for UOENO, before a number of mistakes around the 15 minute mark let HRH back into the game. However, THOM on the Anti-Mage was left almost free-farming while the anarchy unfolded across the map, so while the trades were not great from UOENO's point of view, many of them were due to being outnumbered due to Anti-Mage's absence from fights. By the 25th minute UOENO had regained control and Anti-Mage was too massive for HRH to be able to deal with him. From there it was a relatively easy process to close out the game, despite a mix up where their support Alchemist took an Aegis that Invoker had his eye on, a mistake that didnt prove costly, since by this point, Anti-Mage's illusions were strong enough to score a triple kill. Dwayne used their one game Winners Bracket Advantage to full effect, taking the BO3 with only one game played in the Grand Final. UOENO were playing with a stand-in, after arguable Lower Bracket Final MVP THOM was unable to play. The game started off with a cute cheese strat from UOENO, where they used Earthshaker's fissure to store creeps in the tree line, hoping that this would allow Nyx Assassin to sit by tower and get lots of experience. However, Dwayne's Anti-Mage was alive to the danger and blinked into cut some trees and release the creeps that had been blocked in before it became a problem. Rotations from Dwayne were much sharper than their counter-parts, with their mid Silencer helping out, in addition to good support rotation to establish some good early game dominance, and punishing Outworld Devourer for his relative lack of moblity, Silencer returning to lane with an XP advantage gleaned from his ganks in side lanes. Dwayne's Clockwerk also played out of his mind, with 6 kills from offlane in the first 10 minutes. In a similar turn of events as in the Lower Bracket Final, the team with the uncontested Anti-Mage were able to turn the screw once he got his Battlefury operating, only this time it was Dwayne on a ricing mission rather than UOENO. However, with the space created by the rest of his team, he had a BF in about 14 minutes, and from there they just tightened their hold on the match, eventually running out convincing winners around the 40 minute mark. 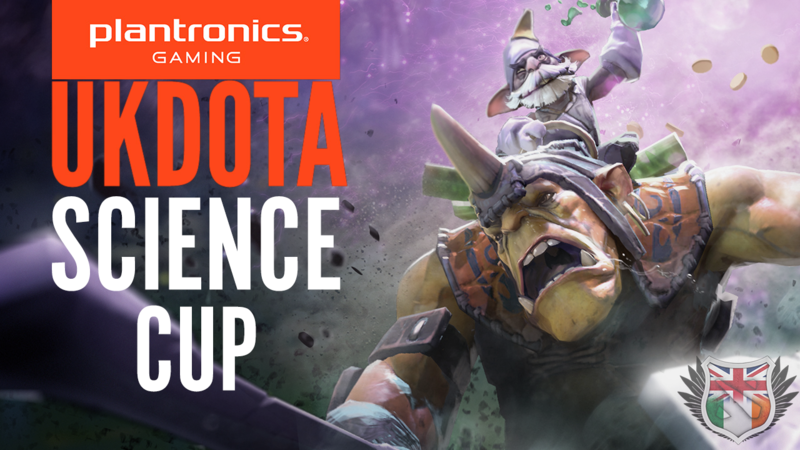 Congratulations to Dwayne 'The John' Rockson for winning the Plantronics UKDota.net Science Cup, taking home 5 RIG Headsets, sponsored by Plantronics. Thanks to everyone for taking part and making the competition the enthralling spectacle that it proved to be. Special thanks are also in order for JoeShow and durka for casting the whole event. VODS and brackets are available to check out also. March is going to be a busy month for UKDota.net and we'll be announcing details of our upcoming events very soon, so keep an eye on our website and the UKDota subreddit!